This is the world’s first Miami to Bahamas Day Trip, by plane, from Florida to Bahamas. There is no other way to visit the Bahamas Out Islands on a day trip from Florida. Currently, visiting Staniel Cay and the swimming pigs is one of the most sought after excursions in the world. There are only a very small number of operators who provide this excursion from Nassau or George Town. We will fly you on our Staniel Cay Tour from our Florida base in Fort Lauderdale Executive Airport in our private aircraft. You will need to arrive at the airport for check-in by 7am. The flights depart promptly at 7:30am. The flight from Florida to the Bahamas is approximately 1 hour. We have a short stop at the International Airport on Andros Island in the Bahamas for all customers to clear immigration and customs before we set-off on a 45 minute flight to our destination Staniel Cay in the Exumas. On arrival at Staniel Cay Airport, you will be transferred to the dock. You expert local tour guide will take you on a guided tour of Staniel Cay and the Exuma Cays. This is a private boat excursion just for our customers with a maximum group size of 9. Our boat tour lasts approximately 5 hours. Because of the time spent outdoors in the sun and on the water we advise all customers to wear appropriate clothing and bring sun protection. Pigs can Swim? Welcome to Pig Beach on Big Major Cay, home to the famous swimming pigs of the Bahamas. You’ll have the opportunity to go swimming with the pigs! We provide food for feeding these Exuma Pigs, but follow directions from you Guide. Pigs can bite! There are a number of interesting stories of how these pigs got here at Pig Beach. Some say they were shipwrecked and swam ashore or that sailors brought them here then left and never returned for them. But the real reason is that the villagers of Staniel Cay put them there to avoid smelling out the village. Unlike some operators, we ensure that the welfare of the pigs are looked after by our local partners. For example ensuring they have a supply of fresh water. Welcome to the exotic world of James Bond. You can snorkel into the Thunderball Grotto, a cave, made famous as a filming location in the James Bond film Thunderball. We provide all snorkel equipment including vests. Its a short swim (approximately 50m) to reach inside the Thunderball Grotto. You will need to be proficient at swimming and snorkelling to take part in this activity. Very restrictive tide levels and weather conditions can affect this activity so you may be given another snorkelling activity as a substitute. We visit Bitter Guana Cay, home to the endangered species of Bahamas Rock Iguanas. When you first step foot on the beach during your Bahamas Day Trip, you will feel as if you’ve travelled back in time to the prehistoric era. Dozens of large Bahamian Rock Iguanas emerge from the vegetation at the top of the beach. The early inhabitants of the Bahamas saw the Iguanas as a source of food, and almost hunted them to extinction. Fortunately, they are now protected by the Wild Animals (Protection) Act, allowing them to thrive in this marvellous habitat. We take you to Compass Cay, the most northerly point on our boat excursion. At Compass Cay you have the opportunity to swim with Sharks. The type of shark here is the nurse shark, which are for the most part harmless to humans. We stop at the intriguing underwater wreck of a plane. The plane was used in drug trafficking and ditched here in the 1970’s. Local legend has it the plane ditched here during a practice run when the traffickers were practising with bags of flour. We provide all the snorkelling gear to take part in this activity. We will visit the beaches around Staniel Cay and visit the Staniel Cay Yacht Club for lunch (to see the Lunch menu at the *Yacht Club click here), set alongside the Staniel Cay Marina which is home to luxury super yachts. The Yacht club has a lively bar and full service restaurant. Be sure to visit the Staniel Cay Yacht Club gift shop! *Please note for Tours in October, the Yacht Club is Shut all month. You can have Lunch at the local fish fry restaurant instead. At the end of the Boat Excursion, in the late afternoon, you will be transferred back to Staniel Cay Airport. From here we will fly back to United States and land back at Fort Lauderdale Executive Airport (or another International Airport on the east coast of Florida if you are on a private charter), where you will go through the US Customs and Immigration process required for entry back into the United States. Please make an enquiry using our booking form in the sidebar or contact us here. Prices are Per Person, fully inclusive of flights, fees, boat excursion, transfers in the Bahamas. See list below for what’s not included. For private group charters contact us for group pricing and availability. If you do not see the date you would like to book then please contact us. This tour only operates if there are at least 6 customers booked on. In the case that we don’t reach 6 customers you will receive a full refund or option to reschedule to a later date. Do I need a Passport to fly to Bahamas from Florida? Yes! Passports are a requirement for all guests. US ID Cards or Birth Certificates are not an adequate substitute for a passport because these are international flights requiring entry to both the Bahamas and re-entry into the United States. The tour departs from Hangar 11 at Fort Lauderdale Executive Airport. Street Address: 2201 NW 55th Ct., Hangar 11, Fort Lauderdale FL 33309. Free Car parking available. The airport is approximately a 1 hour drive from South Beach or Downtown Miami. 6:45 AM: Fort Lauderdale Executive Airport check-in (at Hangar 11). Arrive by 7:00am. Battery pack phone charger if you take photos on your phone, you will take alot! A warm layer if you don’t like air-conditioned aircraft! We can’t guarantee all stops along the tour due to weather, sea conditions and progress of the group along the tour itinerary. We also have the same itinerary Day Trip available which departs from Nassau within the Bahamas. 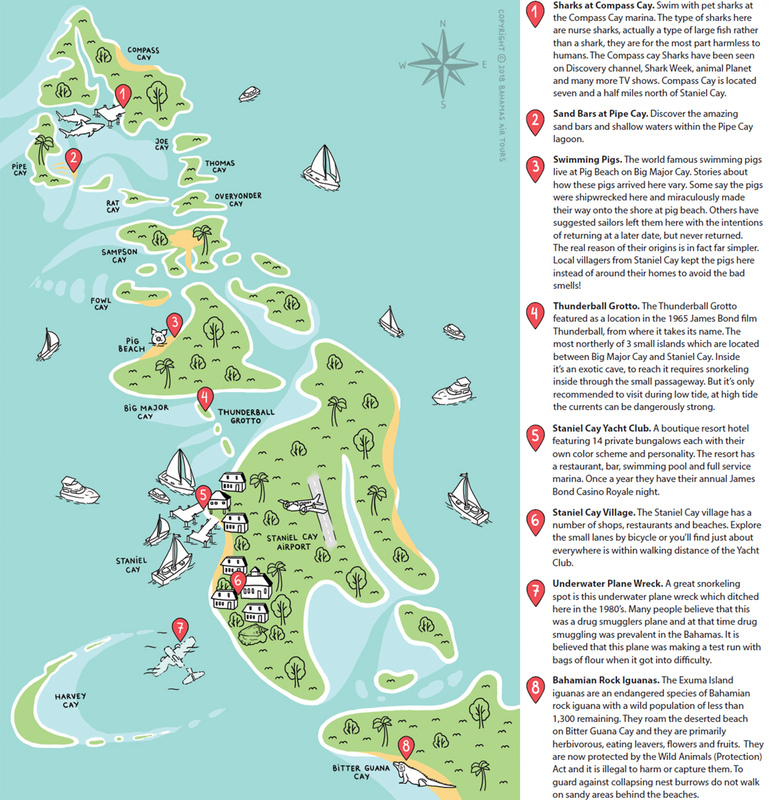 Discover more about Staniel Cay and the Exumas in our informative destination guides or Download our FREE Bahamas Guidebook! Hangar 11 at Fort Lauderdale Executive Airport. Street Address: 2201 NW 55th Ct. , Fort Lauderdale FL 33309. Please arrive by 06:45 AM for check-in, flight departs promptly at 07:30 AM. This was a really great day out and found it very convenient to visit the Bahamas when we only had a few days to stay in Miami. We really enjoyed the Sharks at Compass Cay because we had no expectation that it would this amazing. The sand bar was amazing soft sand just like the Whitsundays. All of the staff were great including the guide and the pilot was very good. We will be recommending this day trip to all our friends! We’ve been before to the Bahamas and knew that if we were going to come back it would have to be by plane after bad experiences with long boat rides and lots of queuing. The Bahamas Day Trip absolutely met all our expectations. Our least favourite part was having to leave! The boat and plane are looked after in great, clean condition. Even the snorkelling equipment is brand new, which is what you expect on a premium tour like this. Our guide Bernie was super good and the pilot was very friendly, it’s great that they didn’t rush the tour. Thank you to all the team, the customer service and responses were all very quick. Exuma has been on our wish list for a while and this tour certainly met all our expectations. We would like to bring our parents back for a tour to a different island next time! Exceeded all my expectations! The tour has so much great value and it’s so well organised. I never felt rushed and was able to just relax in paradise. The tour guide is great fun, let us choose the music and is very knowledgeable. We were taken to the pigs at the end of the day when the pig beach is less crowded. I had no concerns over safety, the Pilot was amazing and the guide very experienced. Brilliant customer service and very accommodating for a late notice tour. I’ve already recommended you to 3 of my friends. Thank you. Thank you for an amazing day out to Staniel Cay. My girlfriend had always wanted to go to Pig beach, so that is when I had the idea to propose to her. Thank you for everything, Zac and Bernie were very accommodating with getting photos of me proposing to my now fiancé! Thank you for this amazing experience, we really enjoyed our day, relax atmosphere, perfect organization, we highly recommend this premium tour to Exuma which is the cherry on the cake of a 3 week trip to the Caribeeans and Florida roundtrip.